I love a good Noodlehead pattern. Anna has a way of taking items that seem like they would be super complicated to construct and making them easy. At last count, I think I’ve made 9 of her divided baskets! So when I saw that she was offering this cargo duffle pattern for free, I jumped on it! 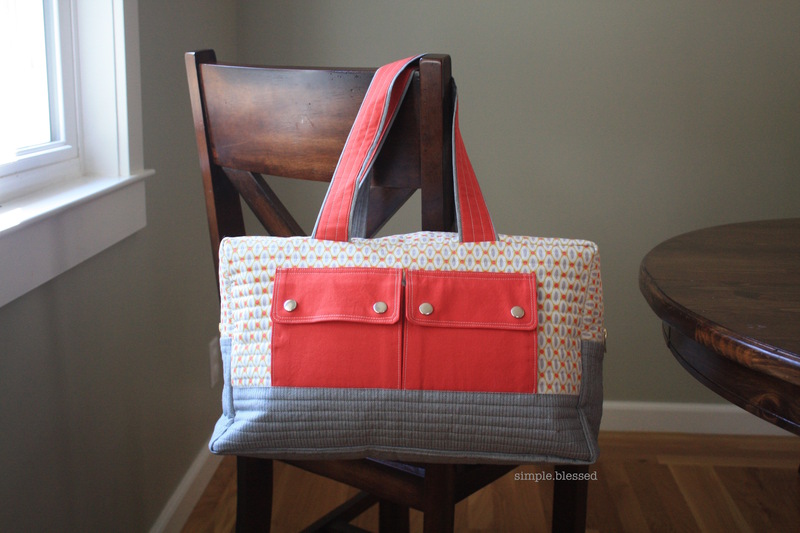 All the details of this pattern are great – the quilt-as-you-go sides, the ease of the zipper installation, the finished look of the interior, and as always with Noodlehead patterns, the perfect touch of a little hardware. I have to admit, I was nervous about the snaps. I bought this snap kit at my local Joann and tested it out on a scrap of fabric. Guys… it was really easy. Phew! The main fabric I used is this Joel Dewberry fabric, purchased from Fabric.com. I took that fabric to Joann and found some coordinating red/orange and gray fabrics in the quilting cotton section. The interior is a gray canvas, also from Joann (sorry I didn’t get a shot of that!). It’s not my typical color palette, but it just jumped out at me for some reason, and I love how it turned out. I copied Kristin’s idea and used this as my hospital bag when Luke was born. It was the perfect size. I’ve also used it as an airplane carry-on, and it fits under the seat in front of you – no need to worry about space in the overhead compartment!